Discussion in 'Suggestion Box Archives' started by jewel_king, Dec 25, 2018.
top_benny, FadedMartian, AncientTower and 4 others like this. The staff already have the ability to do this. We don't need to add a standard bureaucracy to have it done. Everyone is just busy at this time of the year and real life is hitting everyone pretty hard. We'll have items out shortly. Top_Benny, FuzzyPinkSlipper, Spherestar and 1 other person like this. And that's where I'm going to keep them. Players suggesting items is the best position because we can look through them and pull ideas from multiple players in order to create the best promos for a good majority of the community to enjoy, while still maintaining the balance. Players, who are involved in the economy, are primarily suggesting overpowered items. There is such thing as too many cooks in the kitchen. So to make it clear: The STAFF have the ability to do what you've already mentioned. I have staff that HAVE created items, and some that haven't yet been released because they are pending some code. The players can continue to suggest items as much as they want, but a custom team for item creation is not going to be added, because it's unnecessary for our server. FuzzyPinkSlipper and Spherestar like this. Apparently this is why having too many people deciding promos isn't a great idea. Obviously the idea stated in this example is absolutely amazing, but you get the point. Top_Benny, __Devil_, FuzzyPinkSlipper and 2 others like this. Players, who are involved in the economy, are primarily suggesting overpowered items. I assure you it's the majority. SOME players have some really great suggestions thrown in, but it's about 10:1. __Devil_ and Spherestar like this. 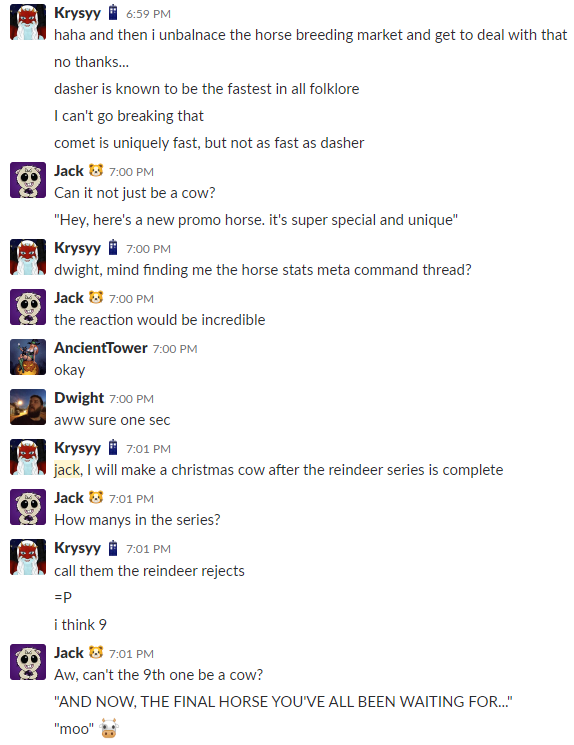 Thank you guys for not making a horse faster than Dasher and breaking the horse economy. I'm not saying your ideas are terrible. They are...unique. Obviously we've implemented some. ThaKloned, __Devil_, Spherestar and 1 other person like this. ThaKloned and Spherestar like this. This would be neat, but as stated above, it might not be a good idea. I'm not so sure how to throw my hat into this ring.